Need to block out light and catch some sleep? We hate it when our sleeping mask messes up our mascara or leave lines on our face. In this buyers guide, we find the most comfortable and best sleeping masks. We will also look at other things that make a sleeping mask an awesome choice for use for travel, at home, or whenever you really need some shut eye. 2 What Makes A Great Sleeping Mask? Perhaps the most awesome part about the PrettyCare 3D Sleeping Mask, aside from it actually being able to block out light, is its contoured shape and design. If you wear makeup around your eyes and want to take a nap while on an airplane without messing up your mascara or eyeliner, then this sleeping mask is for you. The contoured shape, A.K.A. eye cavities, lets you blink behind the mask. This might not work too well if you have long eyelashes, although we should note that we weren’t able to find the perfect mask that blocks out light while providing enough eye room without touching long eyelashes. The sleeping mask uses adjustable velcro straps for simple adjusting. All you really have to do is unlatch the velcro and reattach as needed. You can change the tightness accordingly, and makes it suitable for all head sizes without reliance on a plastic piece that might break. 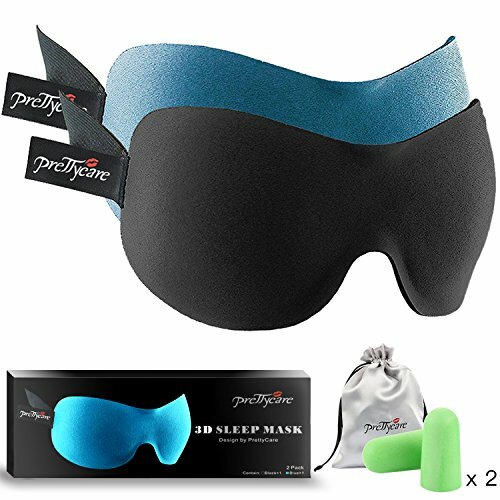 The strap is also comfortably thick, so in combination to making the sleeping mask not being too tight around the head, you’re less likely to leave line marks on your skin. We really love the adjustable velcro strap because it is so much easier to use compared to all other sleeping masks available on the market. The edges of the sleeping mask are smooth, which we sort of wish were soft inward-facing flaps to help block out light for different faces. However, the nose area and having sufficient mask areas on the side ensures much of the light around us can get blocked out. We did have a slight annoyance with the PrettyCare product tag getting in the way and touching our face even though it is on the outside of the mask. We simply cut it off. The sleeping mask is made from polyester, which isn’t a terrible fabric but not the best feely kind. This does mean that the mask is much more durable compared to silk if it is placed in a purse or bag along with other materials. After some use, however, you might find the edges of the polyester peeling. This is expected after a few short months (3 to 6) of use if placed along with other items in a bag. Luckily, we didn’t get any peeling but some reviewers on Amazon had theirs peel back three months after use. (A little sewing can help put the peeling back in place for those who want to fix their mask.) The high-density memory foam within the mask was a nice touch. Unlike other sleeping masks made from pure silk, the memory foam gives and help retain the shape of the 3D mask, which is important if you want the eye cavity. 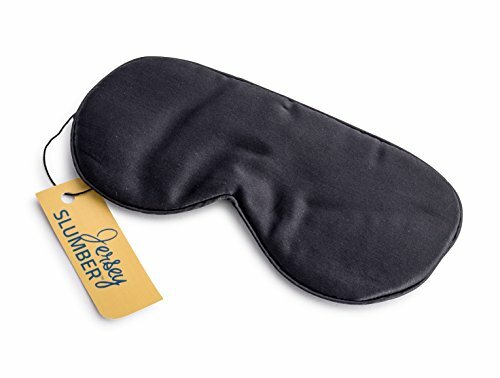 Overall, we love this sleeping mask, especially when used for taking a nap during travel. If you need more reasons for purchasing the PrettyCare Sleeping Mask, it does come with two in one order. There is also two ear plug sets and one silk travel bag to carry and protect your sleeping mask in. We weren’t a huge fan of the green, but we have no complaints on getting the two free sets of ear plugs along with our two masks in one order! For those looking for a super budget friendly sleeping mask, you can’t go wrong with the Jersey Slumber. We loved its simple black, flat design and silky material (long fibre mulberry silk) on both sides of the mask. Definitely smooth on the skin and breathes well. The strap wasn’t too bad, and was easy to adjust overall. We were a little concerned about the fragility of the plastic slider part that is used for adjusting and also holds the entire strap together. We do wish it came with a travel pouch so we could safely store it in our purses, laptop bags, and backpacks, but for its price, it’s not too much of a problem for us. The strap is a little thin and can be tight around the skin. With a plastic slider for adjusting the strap, you might find the mask too loose or too tight around the head. For most people, this shouldn’t be a problem and we didn’t have any problems with using it either. It did, however, leave a slight mark on the side of our forehead, but nothing terrible. It did tangle one of our editor’s hair when used, and we’re not sure how she did it. Our suggestion is to carefully put the sleeping mask strap around your head to make sure your hair doesn’t get caught in the plastic slider. The mask does make contact against your eye area, so if you wear makeup, it can smudge if the mask shifts around. Overall, the mask is really smooth and we absolutely love it. Aside from the bits of critical nuances we picked out about the Jersey Slumber Sleeping Mask, it really is a solid sleeping mask product. The nose baffle wraps comfortably around our nose so no light shines through from there, it’s wide and thick enough to cover a lot of your face, and it does come with an adjustable strap. The silk material also breathes well so you shouldn’t expect any moisture or sweat build up. We found their black sleeping mask to be nearly identical to the Jersey Slumber so we would recommend Jersey Slumber since it’s much cheaper. However, Alaska Bear do offer a wider selection of different colors and design sleeping masks for those who are feeling a little frisky and want to check for other designs. What Makes A Great Sleeping Mask? Blocks out all light. A reasonable expectation. We want our sleeping mask to not allow any tiny glimmer of diffused light to shine through or from underneath our nose area. We’re talking about a total blackout. If we wore our sleeping mask and walked around in public, we want to be able to walk into a metal pole without ever knowing because that is what will make a great sleeping mask! Strap won’t kill you. One of the frequent complaints is the strap being too tight around our heads and unnecessary tangling our hair during sleep. All the masks we reviewed had adjustable straps, but most had the adjustable plastic part pressed against our head uncomfortably so we had to get rid of them. They were especially annoying when the plastic part were on our ears. As a necessity, we want sleeping masks with adjustable straps that can comfortably fit all heads, big or small, without the poorly placed plastic parts. Comfortable without being too tight. This point is similar to the last regarding the straps being too tight, however we felt the need to point it out. Sleeping masks when used that leave lines on our foreheads, cheeks, and nose is a no-no. The sleeping masks we recommend contour to the shape of your face and block out light. Soft and smooth. It goes without saying the sleeping mask should feel soft, cozy, and comfortable against our skin, including the edges and the surface area of the sleeping mask. Below, we touch on the best sleeping masks that are silky smooth feel.